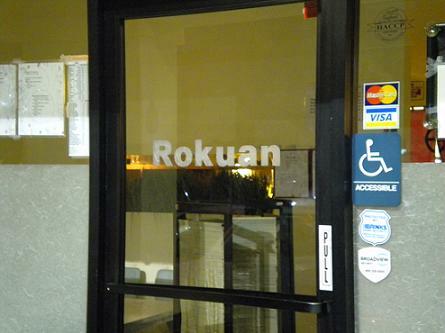 Located in a small shopping center with a Stater Brothers market, Rokuan’s sign says only “Sushi” (“Rokuan” appears on the door.) The interior is less generic. It’s small, dimly lit, with five dark wooden booths, without padding, that would each seat eight; there’s also one standard table and a nine-seat sushi bar. A sign warns the parents of noisy children. Most of the crowd that night was Asian, likely a good sign. Our table got teriyaki salmon with spicy tuna rolls ($20.95), a chirashi bowl ($16.95), a beef teriyaki bowl ($10.50), and assorted sushi: white tuna ($5), scallops ($5.25), squid ($4) and salmon skin cut roll ($5.95). All four of us were impressed by the quality of the ingredients, their freshness and their taste. Rokuan doesn’t skimp on the fish, either: The cuts were generous. Service was attentive, if perhaps too eager to remove plates as they emptied. Chino Hills isn’t easy to get to from my home in Claremont or my office in Ontario, but it’s now my favorite city for sushi. This entry was posted in Restaurants: Chino Hills and tagged Chino Hills, Japanese, restaurants by David Allen. Bookmark the permalink. i live in chino hills and my favorite by far japanese/sushi restaurant is Hayaci. they are located in the Vons shopping center at Pipeline & chino hills parkway next to 31 flavors. i’ve tried most of the sushi places in chino hills and chino as well in other cities and i still always come back to Hayaci. Jay and Stella are the owners and are extremely nice. service is always good. fish is fresh. i suggest to all who read your blogs to try this place next.